On February 21, at the Biltmore Hotel in Los Angeles, Camerata Pacifica announced details of an International Tour of performances at some of the most prestigious chamber music venues in America, England, and Ireland. The Honorable Émer Deane, Consul General of Ireland; The Honorable Robert N. Peirce, Consul General of Great Britain and Northern Ireland; Tom Heneghan, US Regional Marketing Manager of Tourism Ireland; and Adrian Spence, Artistic Director and flutist with Camarata Pacifica, all spoke of their delight in being a part of such a wonderful event - the celebration of peace and togetherness in Ireland through music. Mr. Spence recognized the support of each Consul General and in particular that of Mr. Heneghan from Tourism Ireland. He went on to speak with great pride as to how principal violinist, Catherine Leonard, is widely recognized as the leading violinist in Ireland, and how Ian Wilson, "a friend and fellow Ulster man", composed The Messenger Concerto for Violin and Chamber Ensemble (which they will be performing throughout this tour) while fleeing with his family into Turkey at the time of the N.A.T.O. air strikes on Kosovo. The poignancy of beginning the tour at the Cathedral of Our Lady of the Angels in Los Angeles and ending at St. Anne’s Anglican Cathedral in Belfast was not lost on Mr. Spence. Following Mr. Spence’s presentation, I had the honor of meeting the Consul Generals and artists, as well as Mr. M. Finbar Hill, the Honorary Consul of Ireland. The Messenger Concerto is part one in a three part series. Part two will feature the flute. And I’m already intrigued by part three, which will be based on a poem by Seamus Heaney. The curtain rises and we see a haggard-looking man sitting on a rock (Estragon "Gogo"), staring straight ahead (front, left). Another man (Vladimir "Didi"), also a bit run-down-looking, is standing next to a spindly tree with his back to the audience, looking up at the moon (back, right). 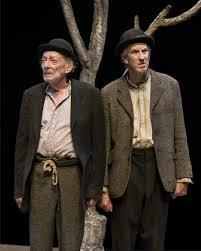 They're waiting by the side of a road for Godot to appear. They begin talking and my heart smiles. The actors are authentic Irishmen – auld fellas from the Gate Theater, Dublin. Gogo struggles to get his boot off and admonishes Didi to stop talking and help him. Didi, after a lot of dithering, eventually gives him a hand. After a while, Ponzo appears, whip in hand, leading a fourth man, Lucky, by a long rope tied around his neck. Ponzo believes himself to be of a higher station in life. A perception reinforced by his fat gut, crusty clothes, vocabulary, and manner. Lucky carries a heavy suitcase in each hand and is severely stooped over and mute the entire time he’s on stage – except for (erect as a soldier) one amazing, roaring soliloquy of piercing sanity that drives the other three to their knees clutching their heads in excruciating anguish. In Act II, Gogo and Didi are unsure whether they should go over and help Ponzo, who is no longer just figuratively blind but also physically blind. Ponzo has fallen on top of Lucky and can’t get up. Again Didi ponders the dilemma, relating it to that of the panther which either leaps spontaneously or thinks too much only to end up slinking back into the undergrowth without getting involved. Gogo and Didi eventually agree to help and become stuck themselves. Gogo is more direct; kind of a rogue; and happy to sleep if he’s let. Didi is more of a searcher; warm-wired for conversation. He doesn’t so much talk, as think out loud; doesn’t so much listen, as absorb. Gogo tugs at the threads that weave the two men together, always asking, "Shall we go?" Didi, ever-faithful, mitigates Gogo’s attempts at unraveling their relationship and yearns for a hug. Gogo always shakes him away. Until the final scene when they do hug and agree to get up and go. Only they don’t actually move. And that’s the end of the play. It was brilliantly acted and the best play I’ve ever seen. There was so much said with so few words. So much to ponder. When the wife and I got up to go, I said to Bunk, "It’s the best show on TV." "Pardon?" said Bunk (actually Wendell Pierce). "It’s the best show on TV," I repeated. "Oh, thanks. Thanks very much." I really wanted to chat more; to have a bit of a laugh; show him I could nail a Dublin accent. But respecting his privacy and the lash of my wife’s tongue, I went with Lucky and kept it mum.